Tuesday night, James and I made our way from Bangkok Thailand to Kuala Lumpur (KL) Malaysia. I was more than happy to get out of Pattaya and our horrible hotel, and from what had seen of the place we were staying at in KL, it looked like I was going to be much happier. 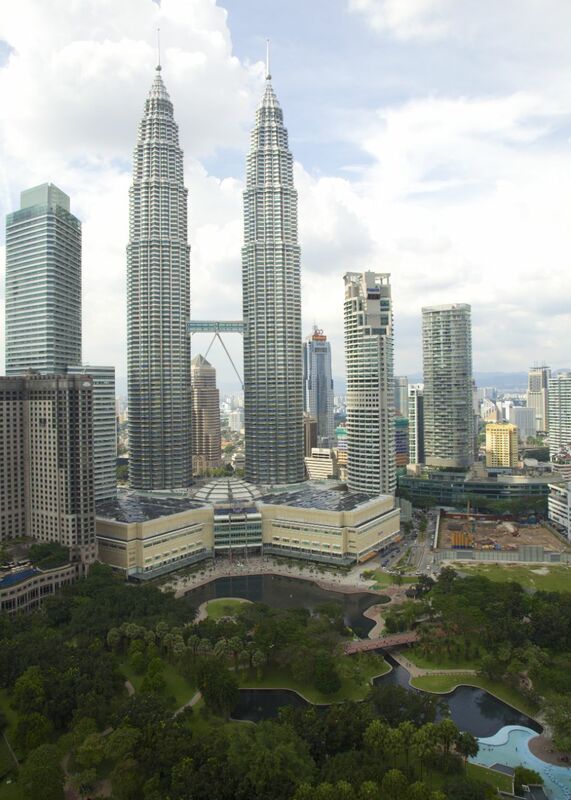 KL has one of the most iconic buildings in the world, the Petronas Towers. I was fortunate that our hotel overlooked the building, and my room faced the right direction. We were staying at the Traders Hotel (a Shangra-la property), and it was a definite upgrade over Pattaya. My room was amazing, and the view was awesome. The view out the window of my hotel room in KL. It was pretty late by the time we got in, and it was raining pretty good. We had a meeting first thing the next morning, After yet another amazing breakfast at the hotel (I love the buffets in Asia! ), we had our meeting in James' room (our rooms were more suites, and had separate living areas) and were wrapped up by noon. We had lunch in the mall at the base of the towers, and managed to get a couple of tickets for later that day to go up to the observation deck on the 86th floor. After lunch, I went to the aquarium in the convention centre next to the hotel. It was OK - smaller than I expected, but had a nice tunnel that walked through a pretty big tank. Lots of sharks and rays and other fish. There were some pretty wild clouds each evening, along with some pretty awesome thunder storms. Between lunch and our trip up the tower, I wandered around and took some pictures. The whole area was very picturesque, but around 4:00 the storm clouds rolled in, and we had the most amazing thunderstorm. It absolutely poured for a couple of hours, and there was incredible thunder and lightning. Around 6, we went up the tower to check out the view. Of course, with the storm that rolled in, the views weren't great. It was starting to clear up, so we got a great view of the insane traffic in the streets below. After doing the tour, we headed back to the hotel for a bit. We had booked dinner at a place the hotel recommended. It was about 5 km away, but the traffic was once again unreal. It took us an hour and a half, and we were late for our reservation. Dinner was great, and after dinner we headed back to the hotel and had a drink at the bar on the top floor of the hotel. It was a very cool - and a bit odd in that it doubles as the pool during the day. Not sure that would fly in North America. The pool... and the bar at night. After the drink, I headed back outside to do some night shooting. The Petronas Towers look amazing at night, and it cleared up enough that I got some cool skies. The Petronas Towers, lit up at night. After a quick stop in KL, it was back home to Vancouver, with a brief stop in Shanghai China just to drag out the return trip.